Western monarchs are on the move. In the Pacific Northwest, they're heading for coastal California, including Santa Cruz and Pacific Grove, for their overwintering spots. A few are tagged. 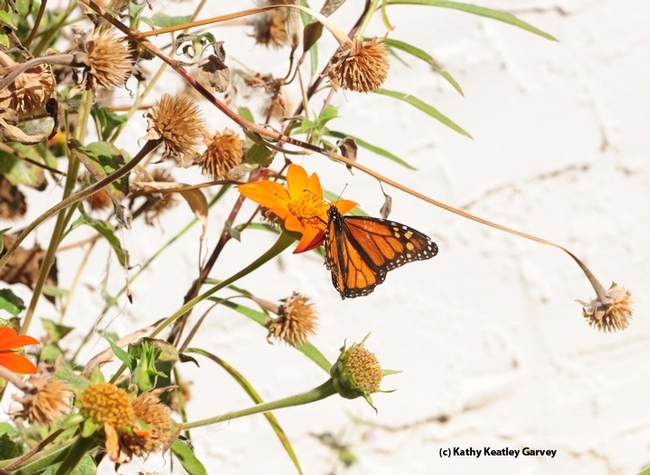 Washington State University entomologist David James and his citizen scientists have tagged some with "monarch@wsu.edu" with a serial number. Look for them! Better yet, photograph them. And then contact him. We've seen one WSU-tagged monarch in Vacaville so far (he was tagged and released by citizen scientist Steve Johnson on Aug. 28 in Ashland, Ore. and fluttered into our pollinator garden on Sept. 5), but many more butterflies are migrating through. 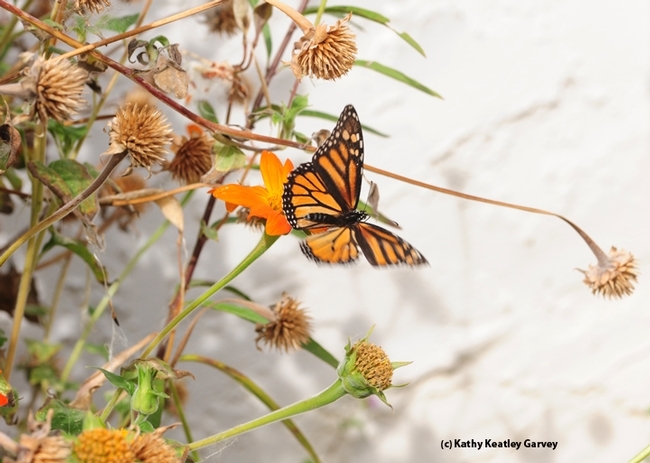 One of the monarchs in James' program was photographed on a San Francisco rooftop on Sept. 18 and seen again Oct. 11 in an overwintering colony in Santa Cruz. It was tagged and released by Molly Monroe and her 5-year-old daughter, Amelia, on Aug. 30 in Corvallis, Ore. Oregon Live did a piece on this. James says this may give hope that the Steve Johnson progeny/Vacaville surprise "may well be found in one of the overwintering colonies this winter!" The entomologist and his family will be searching for tags in overwintering colonies from Santa Barbara to Bolinas from Nov 19-26. 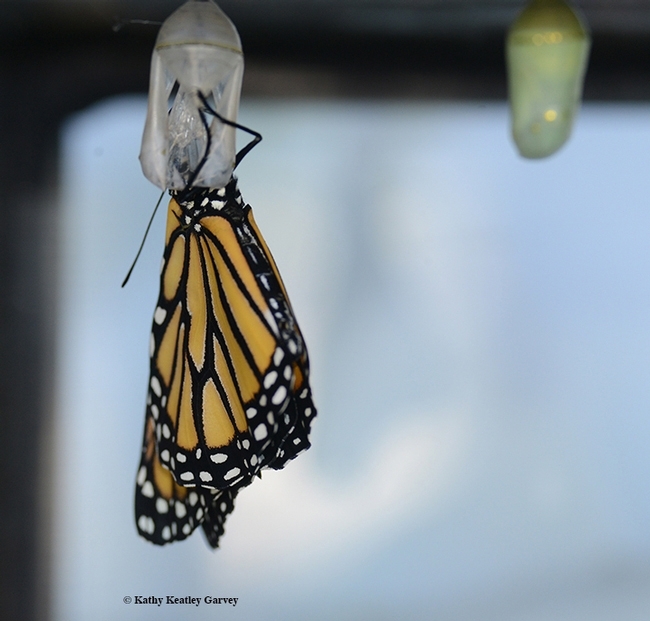 Check out the "Monarch Butterflies in the Pacific Northwest" Facebook page for more amazing stories. 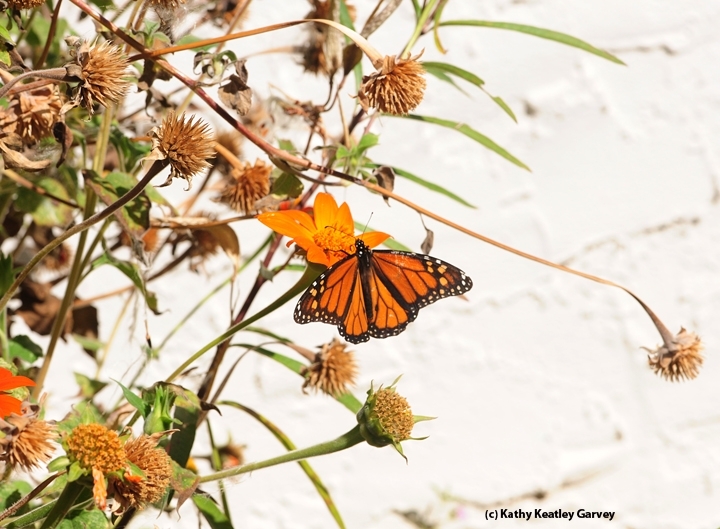 Meanwhile, migrating monarchs continue to make pit stops for flight fuel in our yard. Some look weathered and torn, no thanks to the inclement weather and cunning predators. Some look as if they're on their last legs...er...wings. They all look hungry. Nectar! Nectar! We need nectar! 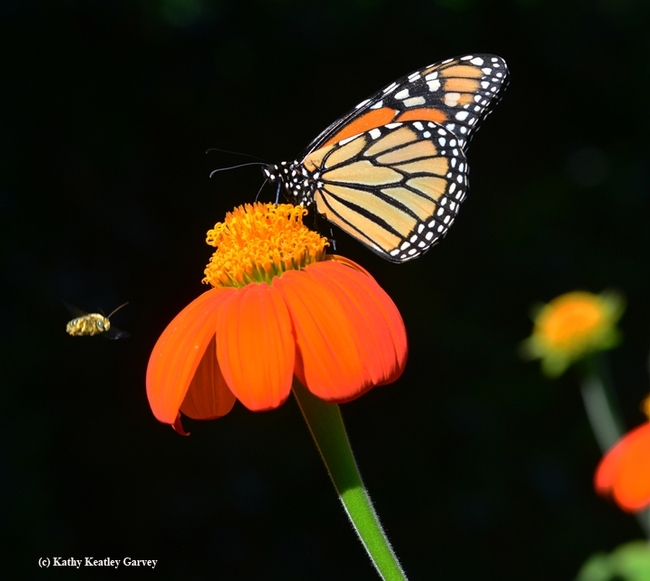 We spotted a male nectaring on a Mexican sunflower (Tithonia) and minutes later, a female touched down on the same flower. The scene reminded us of an exquisite painting. Autumn's reigning colors gracing a one-of-a-kind canvas. 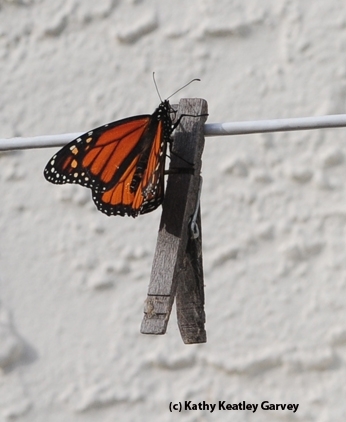 Then came the wonder of wonders: a monarch headed for the clothesline and snuggled up to a clothespin. 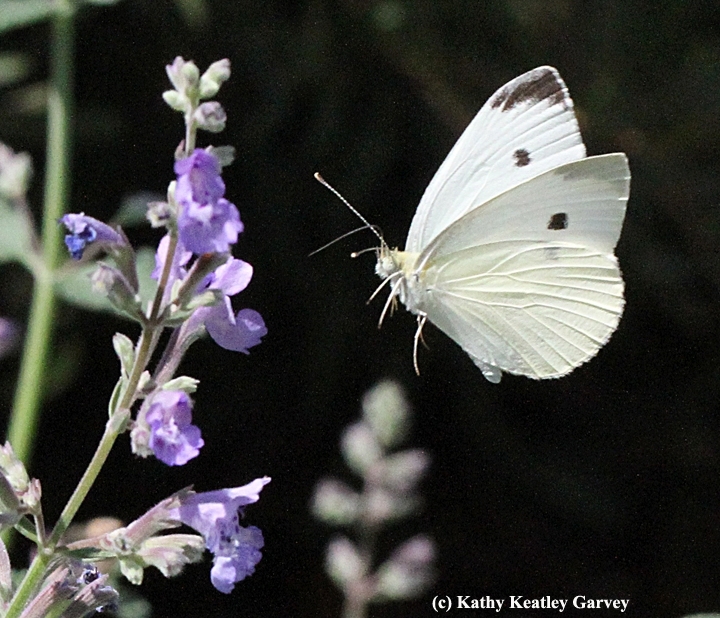 If you see a white cabbage butterfly fluttering by you, net it. The Pieris Project wants it. Entomology Today, a publication of the Entomological Society of America, today covered a story about how graduate students (including Sean Ryan of the University of Notre Dame, Indiana, and Anne Espeset, University of Nevada, Reno), are seeking a "global community of citizen scientists" to collect the white cabbage butterfly, Pieris rapae, for their Pieris Project, launched last summer to study invasion biology and species responses to environmental change. The graduate students want to reconstruct the invasion history and "explore how environmental variation has been shaping the genome and phenotype of this butterfly," according to the article. Anne Espeset is studying for her doctorate with major professor Matt Forister, whose major professor was Arthur Shapiro, distinguished professor of evolution and ecology at UC Davis. 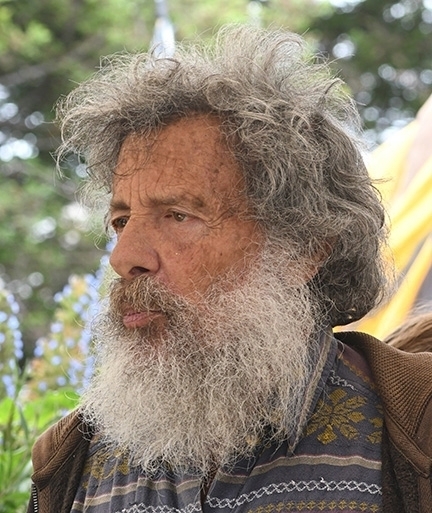 Forister received his doctorate in ecology from UC Davis in 2004. 1) Send them a couple of butterflies from your backyard. Include the date and latitude/longitude coordinates on the envelope. You can find more details at http://www.pierisproject.org. Even though fall is here, depending on where you live, you may be able to catch a few before winter arrives, they point out. 2) Help spread the word by either sharing the project with people you think might be interested in participating or by letting them know of organizations, schools, or any community that might be interested. Email them at pierisproject@ gmail.com. As an aside, the cabbage white butterfly gains notoriety every year in the three-county area of Sacramento, Yolo and Solano, California. Butterfly expert Arthur Shapiro sponsors an annual contest offering a pitcher of beer for the first butterfly of the year collected in one of the three counties. 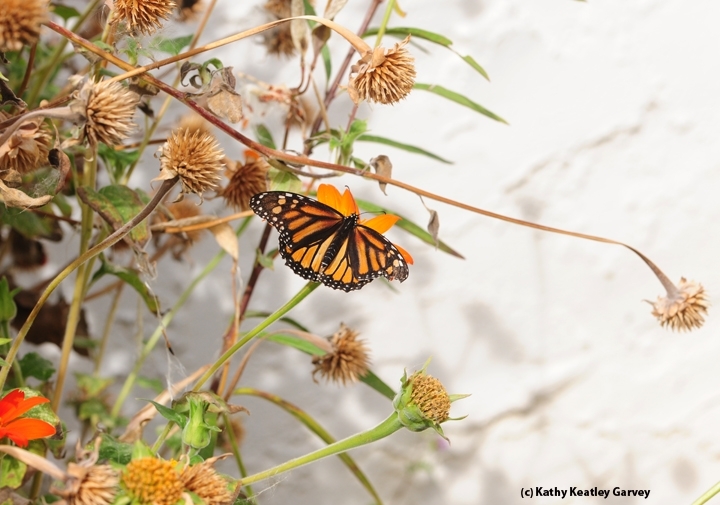 The contest is all part of Shapiro's 43-year study of climate and butterfly seasonality. He monitors the many species of Central California butterflies and posts the information on his website, Art's Butterfly World. Meanwhile, let's all catch some cabbage whites for the Pieris Project.